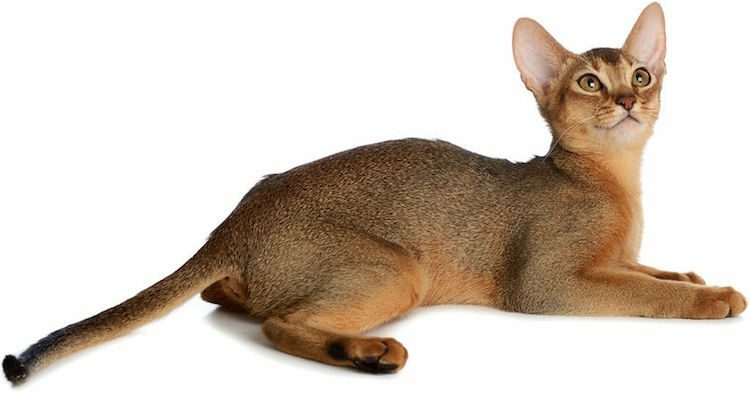 Abyssinians are one of the oldest domesticated cat breeds, and they still grace many homes with their regal appearance and silly antics. Appearing similar to a small mountain lion, the Abyssinian is a graceful, muscular cat with regal movement. This high-energy and inquisitive breed has expressive almond-shaped eyes, a wedge-shaped head, arched neck and large ears. The coat is short and ticked with color featuring multicolored strands. The 4 main colors of the coat include ruddy, red, blue and fawn. The coat is said to be sparkling and iridescent, although this may vary based on the individual cat. Although the origin of the Aby varies, the breed is considered to be one of the oldest domesticated cat breeds. Genetic tests have traced the breed’s origin to the Bay of Bengal in India. The breed appeared in the United States in the early 20th century and quickly became a favorite after further development in the 1930s, when high-quality Abys were imported from Britain. Abys are extremely curious and will investigate every corner and height within reach. They are likely to chase anything that moves and are intelligent, with many people saying their Abys teach them to play fetch. They are playful as kittens and well into adulthood. Abys can be regal and sophisticated one minute and silly the next, making them a fun cat breed for an active family. They are affectionate and people-oriented cats who are close to their family members and are often following people around or in their face, being inquisitive. Toxic items and breakables should be kept well out of reach from Abys. The curious cats will climb and walk nearly everywhere in the home, so assume every surface is a risk. MEDIUM: These active and playful cats love vertical spaces and would appreciate a cat tower or 2 in addition to toys. They are active in the home and won’t miss not being able to go outdoors, although some people have had Abys who make a run for it every time a door opens. Because this breed is active and playful, any noticeable reduction in activity should be addressed with your veterinarian. LOW: This low-maintenance breed should be brushed once per week or more if possible, and this will be especially helpful during the shedding season. Bathing can be done as needed and should start when the Aby is a kitten to become acclimated to the process. After bathing, a pat-down with a towel is sufficient, and the coat can be left to drip-dry on its own. The teeth need to be brushed daily (or, at minimum, once per week) because of the breed’s susceptibility to periodontal disease. The corners of the eyes should be cleaned regularly to prevent any buildup, and the large ears should be checked and cleaned often. Scratching posts or toys should be made available in addition to cutting the nails as needed. PKD is an inherited anemia that can be detected by testing for homozygous genes. Not all Abys and Somalis will be affected by this disorder, but testing should be performed if possible. Anemia can be intermittent or come on strongly and without warning. Regular vet visits should be maintained to monitor dental health and anemia possibilities (if testing has not ruled it out). Abyssinians, as well as other purebred cats, can end up in shelters and rescues. If you do choose to go to breeders, please ensure they do not show any red flags of operating a kitten mill.